Ebooks are a great way to enjoy literature – they’re cheaper than print books due to the lack of print and distribution costs (and completely free if the work is in the public domain), and you start reading seconds after buying one. You don’t need a specialist device like a Kindle either thanks to the many free ebook readers available for your desktop. These are particularly good for students who want to reference texts in their work, add annotations, or refer to online resources. So what makes a good ebook reader? For general use, a clear layout and the ability to sync your bookshelf across multiple devices are essential; for students, note-taking and bookmarks are essential; and for anyone who sometimes struggles with their eyesight, text-to-speech and one-click font customization are welcome additions. Amazon’s official Kindle app for Windows (as well as Mac and mobile devices) is smart and stylish, and although it tempts you with reading suggestions from the Kindle store, the sales pitch isn’t too in-your-face. There’s no setup necessary if you already have an Amazon account. Just log in with your usual username and password and your virtual shelves will be populated automatically (though you’ll have to click a book’s cover to download it, so bear this in mind if you’re planning some offline reading). Notes and bookmarks are synced across devices automatically, as are flashcards – an extremely useful addition for students using digital textbooks for revision. Kindle for Windows also includes text-to-speech function, and changing font sizes and color schemes is as simple as clicking or tapping a button. Freda (from the delightfully-named Turnipsoft) is a superb ebook reader that integrates with Project Gutenberg, giving you access to thousands of free ebooks, and Smashwords, where you can find works from independent authors and publishers. Importing your own ebooks is a piece of cake too, with support for all the most popular formats. You can even connect Freda to your Dropbox account enabling you to access books from multiple devices. Freda supports bookmarks, annotations and highlighting, making it a good choice for students. There’s also text-to-speech for anyone who has trouble with text on screens, as well as auto-scroll and speed-read – a tool that works much like Spritz, displaying words in quick succession so you can read without moving your eyes. Freda is funded by ads, but these are discreet and are only visible on the bookshelf screen; they won’t interrupt your reading. Calibre is an open source ebook reader and manager that’s lightweight and lightning-fast. Unlike many free ebook readers, Calibre supports Amazon’s AWZ format (though it won’t open DRM-protected files) as well as all the other popular ebook file types, and if any metadata is missing (such as genre or cover art), you can add it yourself using the bookshelf’s options menu. One of Calibre’s best features is Reference Mode, which displays the current chapter and paragraph number in the top left – ideal if you need to cite references in an essay. We also like Flow Mode, where text is shown as a continuous scrolling stream without page breaks; not as pleasant as simulated page-turning for recreational reading, but a handy time-saver to avoid flicking backwards and forwards through a textbook. Despite its name, Sumatra PDF is a great little ebook reader, capable of displaying books in EPUB and MOBI format, as well as comic books in CBZ and CBR comic books. Sumatra PDF is a portable app, so you can save it to a USB stick or cloud storage service and use it on any PC. You can save your ebooks in the same place too, eliminating the need to sync your library. It’s easy to adjust basic settings like font size, but Sumatra PDF’s advanced options can only be edited by opening a text file and typing in new values. If you want to change the page color, for example, you’ll need to find the hex code for your preferred shade and enter it on the appropriate line. It’s not difficult, but we’d prefer a graphical interface. There’s no way to add notes or highlights, but the convenience of carrying your ebook library and reader anywhere might outweigh those drawbacks for you. Icecream specializes in smart, no-frills software, and Icecream Ebook Reader is no exception. It supports EPUB, MOBI, PDF and FB2 ebook formats, and once you’ve imported your books they’re arranged in a neat bookshelf with a choice of viewing options. 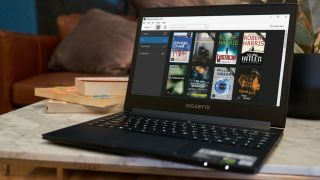 One particularly handy feature is the ability to archive and export your ebooks; ideal if you use more than one PC and don’t want the hassle of importing your books twice. There’s no cloud syncing though. The reader itself is similar to the Kindle app in appearance, with one-click (or tap) buttons for changing font size, color theme (day, night, or sepia), and viewing the table of contents. Unfortunately, some of the options you can see in the menus are only available if you hand over US$19.95 (about £15, AU$25) for the Pro version. Premium features include importing multiple ebooks simultaneously, adding notes, editing metadata, and copying text. The free version of Icecream Ebook Reader is quick and very easy to use, but only really suitable for recreational reading. Students will find the lack of note-taking and copying frustrating.